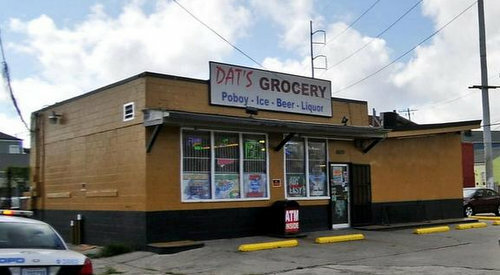 A developer has received tentative approval to tear down the Dat’s Grocery on Magazine Street, but city officials said that actual demolition work cannot begin until he has filed development plans with the Historic District Landmarks Commission. Developer Cornelius Payne told the commission last month that banks have been hesitant to finance his redevelopment plans for the Dat’s Grocery site at 1600 Magazine because of the city’s reputation for preventing older buildings from being torn down. But the building’s architecture does not represent an essential part of the character of the surrounding Lower Garden District, Payne said, so he asked the commission to help him show potential lenders that demolition of it will not be an obstacle. The HDLC staff agreed with Payne that the building itself was expendable, but noted that the HDLC requires redevelopment plans in place before approving demolition requests. Commission chair Jesse LeBlanc — also a Lower Garden District resident — suggested giving Payne a tentative approval for the demolition, but withholding the work permit until his redevelopment plans are ready, filed and approved. HDLC Director Elliot Perkins agreed that LeBlanc’s suggestion would work, and Payne said he thought it would allow him to get the redevelopment started. Technically, Payne’s plan must be approved by the HDLC Architectural Review Committee before his demolition can proceed. “Once you get together with your architect and you know what you’re going to do with the project, and hopefully it comes to us with a really easy thing,” LeBlanc said. This idiot commission approved the demolition of grand monuments without a redevelopment plan, but wants a concrete block store to remain unless the owner fronts the cost of some formal plan of redevelopment. Exactly the problem. It’s ridiculous. Seems like an easy solution to this. Just rename the store the Robert E. Lee Corner Grocery, and he will get permission to demolish it at once. Heck, the city might even do it for him. Since when is a having a vacant lot not permitted?? The owner will, of course have to properly secure it with a fence, and maintain it by cutting grass, etc., but it should be his choice to use his property that way if desired. On the other hand, he could just let the building become vacant and blighted like the old Lindy Boggs Hospital and the Plaza Tower because nobody in the government seems to mind if that happens.